Recently, because I am the editor, I have been in and out of the studio editing the footage that we have filmed so far. I've been familiarising myself with Final Cut Pro, and capturing clips from our tape and saving them in the right places on the computer. I have then been looking back at my teaser plan and shot lists to remember what we want our teaser to look like and where about on the timeline I need to position certain clips. I have also been researching some film posters briefly to gain some inspiration as to what I want my film poster to look like. One of the film posters that I looked at was for the film 'Alfie'. Our group has looked very closely at this film, and so I thought it would be extremely useful to see what the poster for it looked like. As you can see, this particular poster for 'Alfie' is extremely simple, yet quite sophisticated. The 'L' has been substituted for a photo of Jude Law, which I feel is quite clever and makes the whole poster look much more visually interesting. The white background contrasts with the black text, making the heading stand out extremely well. 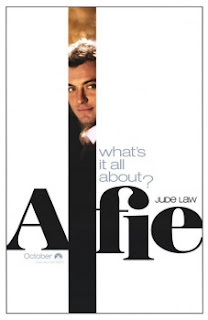 The letters of the word have also been positioned on different levels, making the poster quite playful and suggests to the audience what Alfie's character might be like before they have even seen the film. For my poster, I want to keep it this simple and professional, yet I would also like to include images of the women that feature in the film as well, to give viewers a much clearer idea as to who is in our film. Another poster that I have looked at is for the film 'John Tucker Must Die'. Similarly, our group has reasearched this film to gain inspiration, and so it would be useful to me to analyse the poster for this film as well. As you can see, the poster for 'John Tucker Must Die' is aslo extremely simple yet effective. The white background is something I would definitely like to use in my poster, as I feel it makes it look much more sophisticated and does nto distract users from the main focus of the poser. The film name for this particular film has been positioned on the model's lower back and in the from of a tattoo. I feel that this is quite clever and gives an idea as to what age group this film is aimed at (normally young adults have tattoos, probably between the ages of 18-25 years). The tag line has been positioned at the top of her vest top, which I personally do not feel is a place that attracts a lot of attention from the user. However, there is not really anywhere else it could have been positioned and so at the top is the best place for it. This poster also uses a clear colour scheme of white and maroon, which makes it look extremely professional. I will therefore try to stick to the same sort of colours in my poster as well. I have focused primarily on 'Alfie' and 'John Tucker Must Die' for my research so far, so I thought it would be useful to look at other films in the same genre as my own to see if the posters and teasers all relate as well. 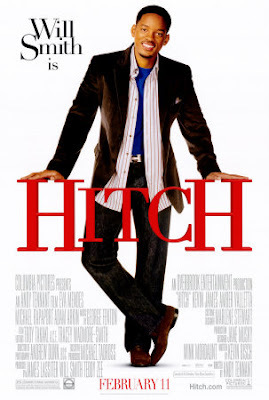 I decided to look at the film 'Hitch', as this is a Romantic Comedy which also focuses on one leading man. Above is the trailer for 'Hitch', and I feel it is quite a successful film trailer. It is very entertaining, and there is a mix between clips from the film and clips that aren't. The voiceover makes the trailer easy to follow, giving users a clear idea of what the film is about. I also especially like the ending how the name of the film comes up, followed by an 18 second clip of footage and then the final text advertising when it is out on DVD appears after. I feel that this is a good way to keep the audience watching, as they are not expecting any more footage after the ending title comes up. I would like to include something like this in my film as well, but perhaps a shorter scene which is still humorous and keeps the viewers entertained and curious as to what is going to come next. Once I still have their attention, they are much more likely to see the last clip advertising when the film will be released. I have also looked at the film poster for 'Hitch' to help me get ideas for my own poster. As you can see, the poster is quite simple with just an image of 'Hitch' in the centre with the film name in red and on a white background. I really like this poster and feel that even though it is quite simple, it is still quite effective. It has all necessary information (apart from a tagline which I would have liked to have seen). I feel that it looks extremely professional having him lean on the film name like that, even though it is clear he was not actually leaning on it in real life. I would like to have the character 'Nick' lean on the words in the same sort of way for my poster, as I feel that this is quite humorous and gives users and idea of the sort of character he is (quite laid back and 'cool' by slouching like this). One thing that I would probably change about this poster, apart from the lack of a tagline, is the billing box. I dislike how it is split into two sections and feel that it would have looked slightly better if it was simply displayed at the bottom as a whole section.